The Portal comes in two configurations: a $200 model with a 10.1-inch 720p display, and the pricier $350 Portal+, which features a larger 15.6-inch 1080p display that can rotate between portrait and landscape view. The more expensive version also sports an extra subwoofer that should result in better bass, but aside from that, both share similar specs including quad mics and a front-facing, 12-MP camera with an 8x zoom. The standard Portal with its plastic camera cover on. That 8x zoom camera looks to be Portal’s major point of differentiation, as the zoom enables Portal to track and follow your face around the room when making video calls over Messenger, which sounds either really cool or really creepy depending on how you feel about Facebook as of late. However, to address potential security concerns about Portal (aside from the general rising distrust of Facebook), Facebook says the Portal’s microphones and camera feature an option that will “physically” disconnect those components, and the company has installed an indicator light that glows red so you know they’re off. Facebook even includes a plastic cover that can be placed over the Portal’s camera, though its simple, non-integrated design makes the cover seem like a bit of an afterthought. You will also be able to set a passcode to better lock down the system, or turn on Home and Away mode so Portal knows to send Messenger calls to your phone when you’re out of the house. The Portal+’s larger display can rotate if you are tight on space, or to better see video calls made from a phone. Like its competitors, the Portal works with a handful of steaming media services such as Spotify, Pandora, Food Network, and of course Facebook Watch. And to pile onto the mountain of phrases people need to dodge on a daily basis, Facebook’s new device even has its own wake words (“Hey, Portal”) so you can make commands hands-free. The Portal also sports Bluetooth, so it can play music when paired to a nearby device, but critically, like the Echo Show, it lacks official support for YouTube and other major streaming services like Netflix. Currently, it doesn’t seem like the Portal has integration with any major smart-home platforms, and it’s unclear if it even includes its own web browser. The real head-scratching thing about the Portal is that while you’ll be able to it to browse your Facebook photos and videos and check the weather, Facebook’s laser focus on video calling means you won’t be able to view other tenets of the core Facebook experience like the News Feed using the Portal. 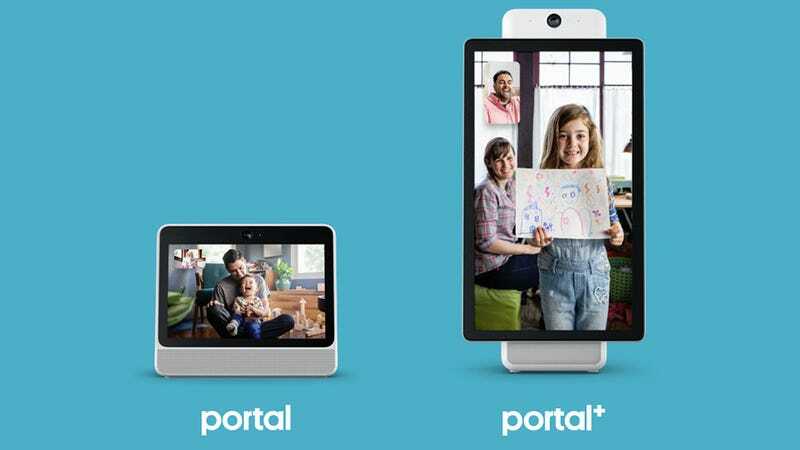 That means the Portal is in essence a smart display with less features than what you’d get from competing Alexa or Google Assistant-powered devices, that tries to make up for that gap with better face chat features. That seems like an incredibly narrow niche—and with Facebook recently having been hit with another round of questions regarding users’ privacy, security, and the level of control they have over their accounts, it’s hard to say how much trust people have left in Zuck and co. And that’s before you consider that this device was already reportedly delayed once in the wake of the Cambridge Analytica scandal. But if you really can’t help yourself, the Portal and Portal+ are available today for pre-order with shipments slated to go out in early-to-mid November. A University Is Putting 2,300 Echo Dots in Student Living Spaces and What Could Go Wrong?